Harry V. Jaffa died last Saturday at the age of 96. The New York Times has a good obituary. Jaffa was famous among political theorists for his scholarly studies of Aristotle, Thomas Aquinas, Abraham Lincoln, and the American founding. He studied with Leo Strauss at the New School for Social Research, and he earned the reputation as one of the deepest thinkers among Strauss's students. In the Strauss Wars, he was the leader of the West-coast Straussians. Academic scholars rarely receive prominent obituaries in The New York Times. But as this obituary indicates, he gained some prominence in American history as a "conservative scholar and muse for Goldwater." I remember well watching Barry Goldwater's televised speech accepting the Republican nomination for President in 1964, which included two famous lines: "I would remind you that extremism in defense of liberty is no vice. And let me remind you also that moderation in the pursuit of justice is no virtue." Goldwater's critics had warned that he was a right-wing extremist who was linked to extremist groups like the John Birch Society. So many people were surprised and shocked that he would boldly embrace the label of extremism. Only few people knew at the time that these words had been provided to Goldwater by Jaffa, who was involved in the writing of the speech. I have heard that Strauss sent Jaffa a letter telling him that recommending such language to Goldwater was a big mistake, because it would contribute to Goldwater's defeat. 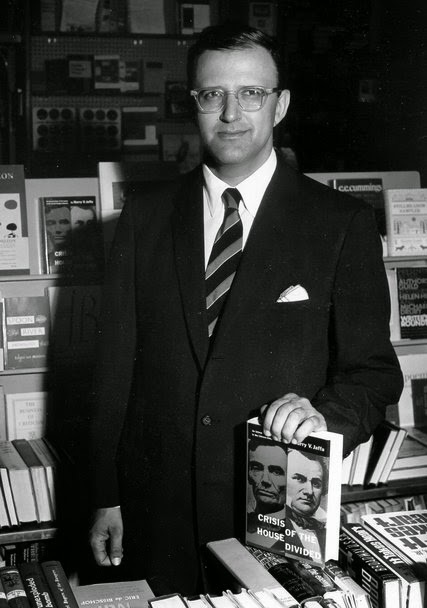 Later, Jaffa explained that he never thought Goldwater had any realistic chance of winning in 1964, and that the real goal of the Goldwater campaign was for conservatives to take control of the Republican Party and then to elect a conservative Republican president sometime in the future. When Ronald Reagan started his political career in 1964 with a famous nationally televised speech for Goldwater, and then went on to be elected president in 1980, it seemed that Jaffa and other Goldwater Republicans had succeeded. 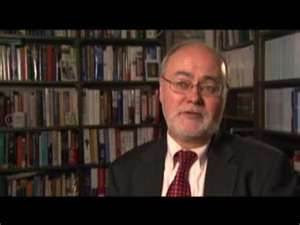 Jaffa's greatest contribution to the American conservative movement was in adding intellectual depth to conservative thought by showing how conservatism could be understood as part of an intellectual tradition that included Aristotle, John Locke, the American constitutional framers, and Lincoln. The appeal to Lincoln was controversial among some conservatives and libertarians who saw Lincoln as contributing to the tradition of liberal progressivism. John Barr has covered this debate over Lincoln very well in his book Loathing Lincoln. I am especially saddened by Jaffa's death, coming as it does after the deaths in recent years of Joseph Cropsey and George Anastaplo, because these were the three men who gave me some connection to Strauss, whom I never met. Unfortunately, there was a break between Jaffa and Cropsey during their final decades of life, because of some personal disputes, despite their having been friends from childhood in New York. Jaffa and Anastaplo remained close throughout their lives, despite the fact that Anastaplo did not share Jaffa's commitment to American political conservatism. It was a privilege for me to become one of Jaffa's friends. I remember well when he invited me to lecture on Darwin and evolutionary ethics at Claremont McKenna College in 1987, and I stayed at his home. I am also reminded of his generosity in writing publishing blurbs for two of my books. For Darwinian Natural Right, he wrote: "Larry Arnhart is at the cutting edge of the frontiers of political philosophy today. His book on Aristotle and Darwin crowns more than a decade of research on the biological foundations of human nature. He has shown that it is no longer possible to assume that our biological nature is unrelated to our moral nature. He has therefore gone a long way to restoring the credibility of 'the laws of nature and nature's God,' and of the political science upon which this nature was founded." For Political Questions, he wrote: "This is a brilliant adaptation of Thomas Aquinas's technique of the disputed question. Thomas called the Summa Theologica a textbook for beginners, although one may wonder how many beginners ever mastered more than a small portion of it. Larry Arnhart's book really is for beginners in political philosophy, the best--I think--that there is today. It is not a substitute, but an encouragement and aid to reading these books, and to thinking about those questions. And it is profitable equally to our beginning students and to those of Thomas Aquinas." Jaffa was especially generous in writing these endorsements, because he was skeptical about my commitment to Darwinian evolutionary science. But as is suggested by what he said about Darwinian Natural Right, he shared my belief that natural right can be rooted in human biological nature. Some related posts can be found here, here, here, here, here, and here. The anecdote about Strauss's reported response to the Goldwater speech is fascinating, because there is virtually no record of what Strauss made of his students' careers. As for Jaffa's legacy, it is also interesting to point out that his intention with the Goldwater speech was not actually to win the election, but to help push the Republican Party to the right. If that was the goal, then Jaffa was certainly a great success - and the Reagan administration turned out only to be the tip of the iceberg. But to what extent do these changes actually vindicate Jaffa? I recall an interview with New York Magazine a few years back where he denounced the Tea Party, which remains a powerful force in the Republican Party. On the other hand, although Republicans still express some opposition to the general trend of public acceptance of homosexuality and even gay marriage, their opposition in this regard actually pales beside the apocalyptic fire-and-brimstone howling that Jaffa engaged in on this subject for many years. And Lincoln's star has certainly risen in many quaters, partly thanks to Jaffa - but to what extent is it Jaffa's Lincoln that is admired today (on either the right or the left)? Nevertheless, "Crisis of the House Divided" surely remains one of the most influential American political books of the second half of the twentieth century. But the question remains whether Jaffa's career as a whole is coherent. A few of his students have tried to reconcile "Crisis" with "New Birth of Freedom". Yet I'm not aware of anyone who has even attempted to square "Thomism and Aristotelianism" with "Thomas Aquinas Meets Thomas Jefferson". The most insightful analyses of Jaffa that I know of are by Michael Zuckert, yet Zuckert concludes that Jaffa was ultimately not totally coherent. I know that Jaffa wrote several responses to Zuckert, but I don't remember them being very illuminating. One final note: as I recall, Jaffa was Jewish. Yet unlike many Straussians, he had almost nothing to say about Jewish matters in general, or how they pertain to his understanding of religion and politics in particular - something which is very striking when one considers that Jaffa spent much of his career engaging in polemics about the nature of conservatism and the "theological-political problem". Jaffa showed his dark side in his mean-spirited ranting about homosexuality--"the right to be queer, a very queer right." I agree that Jaffa's position was not fully coherent--that he never explained how Thomism and Aristotelianism was consistent with the rest of what he wrote. Walter Berns also suffered from incoherence insofar as much of his later writing contradicted what he wrote in Freedom, Virtue, and the First Amendment. I once raised this point with Berns, and he responded by repudiating everything he had written in Freedom, Virtue, and the First Amendment. At least, he admitted that he had changed his mind. What do you mean when you say that Jaffa was "skeptical about [your] commitment to Darwinian evolutionary science"? Was he skeptical about you and whether you were, in fact, committed to Darwinian evolutionary science, or was he skeptical of Darwinian evolutionary science, and, if so, why? As indicated in some of the posts that have links at the end of this post, Jaffa sometimes made comments that indicated doubts about the truth of Darwinian science. Oddly, he once told me that he had never actually read Darwin. But this did not stop him from criticizing what he thought Darwin had taught. Why did Jaffa think he had a basis for thinking he had an opinion? I once suggested to Jaffa that if he were to read Darwin, he might discover that his interpretation of Darwinism was not accurate. I have had the same experience with some of Jaffa's students. A Very Nice post Larry. Thank you, and thank you for all you’ve done. Was Leo Strauss a Midwest Straussian?